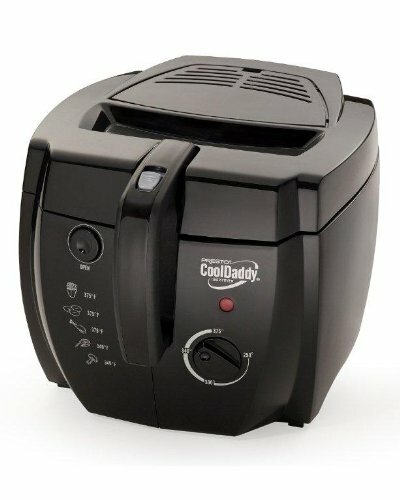 If you’re looking for the best home deep fryer, then we can help! We’ve created a top-three list that highlights the three models that we fell in love with. These products were selected based on specific criteria that we looked for. You can choose from one of these three models for optimal results when deep frying your next meal. It did take a while – but we ended up going with this model as our #1 pick. It’s the Presto 05442 CoolDaddy Cool-touch Deep Fryer, and in terms of overall value for the money, it smashes the competition. It’s perfect for French fries, shrimp and chicken. However, you can certainly make a variety of other foods with it, but you might want to purchase a quality recipe book separately. 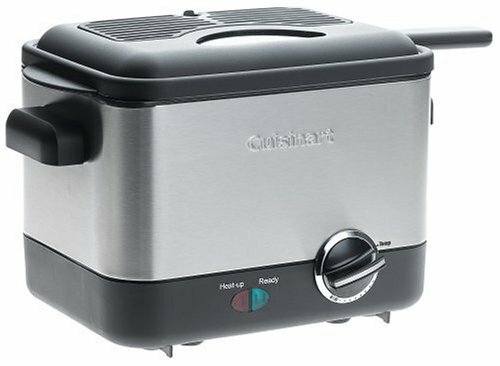 This model has an adjustable thermostat, which makes it VERY easy to select a desirable frying temperature. It has an indicator light that signals and lets you know if the oil is ready to use. It has a locking cover that prevents spattering while also reducing odors. The large viewing window allows you to monitor the frying process without ever having to lift the cover – that is GREAT. There is a charcoal air filter that absorbs all of the frying odors. There is an exterior basket handle that you can use to lower your food into the oil while the cover is closed, which greatly reduces the chance of oil spatter. For very easy and quick cleaning, the frying pot is removable. With this model, you can truly make delicious deep-fried food. It greatly reduces the risk that food will turn out to be soggy and fat-logged. For the price, this is the BEST product for deep frying at home. It’s not perfect – and some more expensive models have more to offer – but it’s an excellent choice for MOST people. You can buy it here. 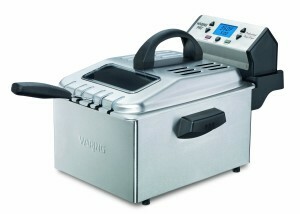 Our second pick is the Waring Pro DF280 Professional Deep Fryer. It costs more money than our top pick, but it certainly has more to offer. It has a removable, 1800-watt immersion style heating element, which means the element is actually inside of the fryer. It has a one-gallon, removable oil container that is coated with enamel and has a pouring spout. It comes with two small and one large heavy-mesh baskets. The baskets have a cool-touch, collapsible handle. The 60-minute digital timer is perfect for temperature control. The lid has a viewing window. The outside of the fryer is coated with brushed stainless steel, which screams durability. It has a 2.3 LBS capacity, which is large enough to make a seriously large batch of French fries and more! This model is perfect for chicken and fish, but you’re not limited to these options. The only issue this model has is that it does require quite a large amount of oil. However, it’s a great product for price, and it’s good enough to make #2 on our list. You can purchase it here. Our third pick is slightly less expensive than the #2 pick – it has a mid-range price. It’s the Cuisinart CDF-100 Compact 1.1-Liter Deep Fryer. However, it’s quite small, and its basket can only hold about ¾ of a pound. One of the reasons why it made the list is because it heats up VERY quickly. You won’t have to wait around to start frying with this model. It has a non-stick, die-cast bowl, which has an attached heating element. This model does have some VERY good heating. Built to North American Electrical Standards, this model, although small, is sure to delight. The cover has been designed perfectly because it closes very tightly, which all but eliminates oil splatter. Yes, it’s quite small, but the benefit of the size is that it uses a tiny amount of oil. It’s perfect if you don’t plan to fry foods very often. It’s actually the ideal model for smaller side dishes, such as egg rolls, jalapeno poppers and others. For the price, this is a superb product. It’s not nearly as great as our first and second picks, but it’s certainly worth the money. You can go buy it over here.